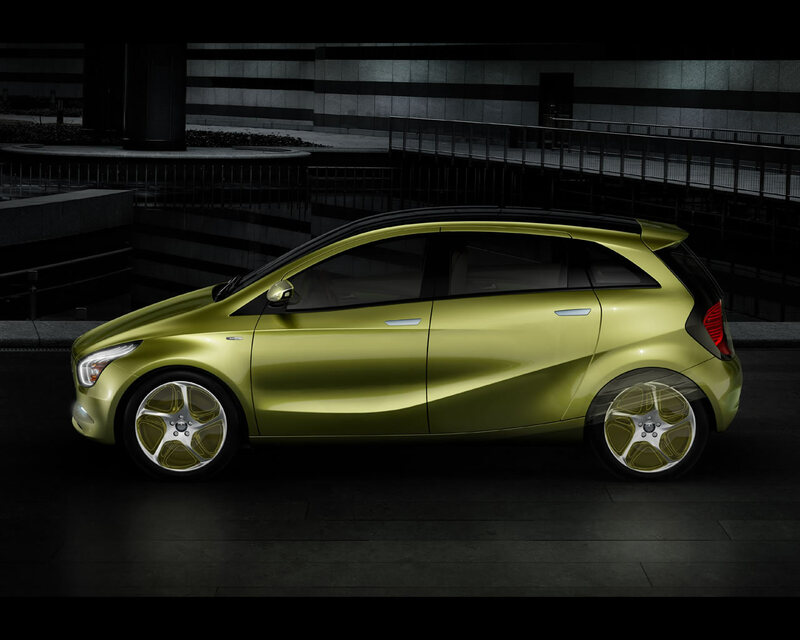 The Mercedes Benz BlueZERO is a near serie concept which include three different drive configurations for a future electric car. There is the BlueZERO E-CELL which is a plug-in battery powered electric drive and a range up to 200 kilometres using electric drive only. 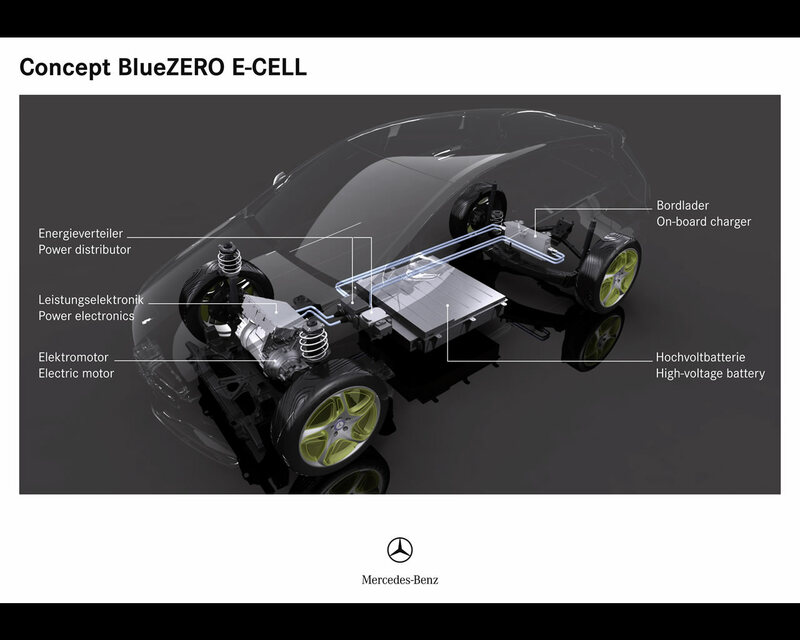 The BlueZERO F-CELL (for fuel cell) comes with a range of well over 400 kilometres using electric drive powered by an hydrogen fuel cell. Then there is the BlueZERO E-CELL PLUS which is a plug-in battery-electric drive assisted by an additional internal combustion engine as power generator (range extender). This version has an overall range of up to 600 kilometres and can cover s distance of up to 100 kilometres before requiring the range extender. 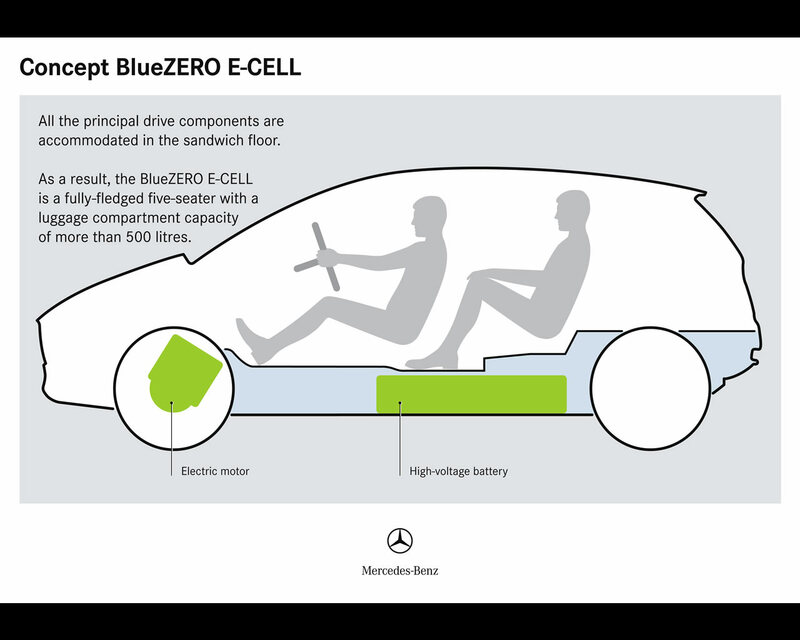 The three BlueZERO variants are based on the unique sandwich-floor architecture which Mercedes Benz introduced some ten years ago, initially for the A-Class and then for the B-Class, one of the aims being to integrate alternative drive systems. Advantages of the modified construction include the positive effect of the major drive components on the centre of gravity, their space-saving design and the fact that they are extremely well protected within the vehicle underbody. 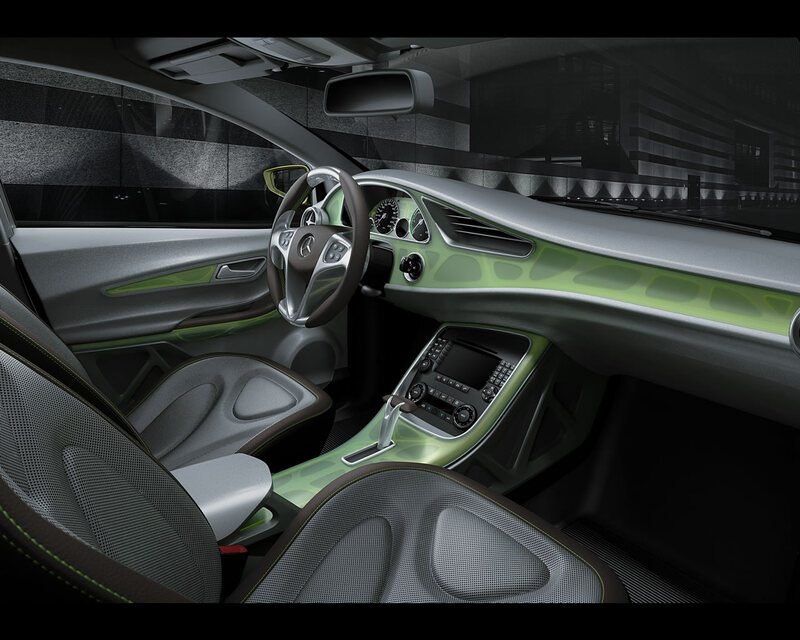 The five seats BlueZERO concept cars also sets standards in terms of lightweight design, interior layout and body form. All three BlueZERO variants share the same key technical components while the design and vehicle dimensions are identical. Measuring just 4.22 metres in length, the BlueZERO models combine compact exterior dimensions with a generously proportioned and variable interior and luggage compartment. Five fully fledged seats, a payload of around 450 kilograms and a luggage compartment capacity of over 500 litres make for outstanding everyday practicality. Thanks to their sandwich construction with raised sitting position, the cars also offer and exceptionally high level of crash safety for the passengers and the technology, not to mention excellent all-around visibility. "Our modular system allows different drive configurations for every customer requirement", says Dr Thomas Weber, the member of the Daimler AG Board of Management responsible for corporate research and development at Mercedes Benz Cars. "The modified sandwich-floor platform provides the perfect basis for a wide model range with electric drive systems. We are also developing a new, additional platform for future compact models with power units based on optimized internal combustion engines. The intelligent networking of both architectures enables us to develop our product portfolio extremely flexibly and efficiently. 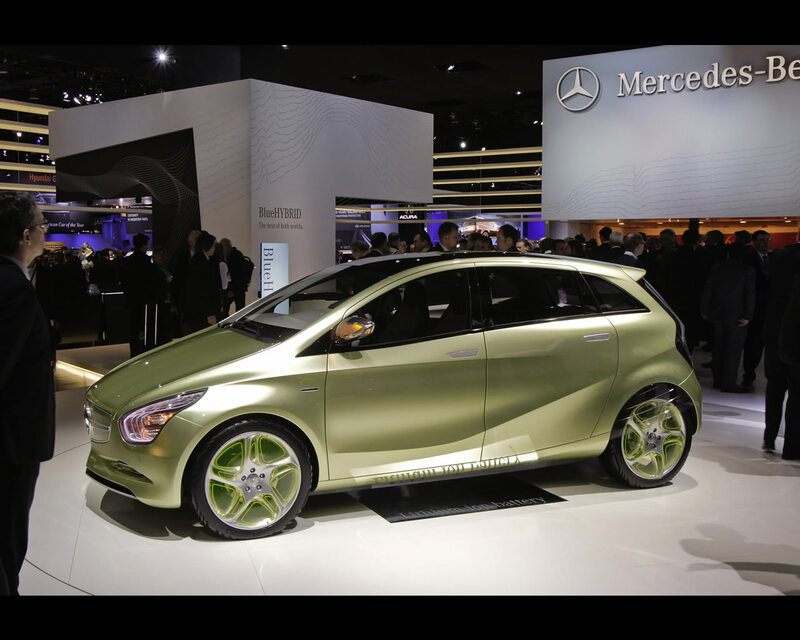 From 2009, we will be producing the first Mercedes fuel-cell powered cars on a small scale. 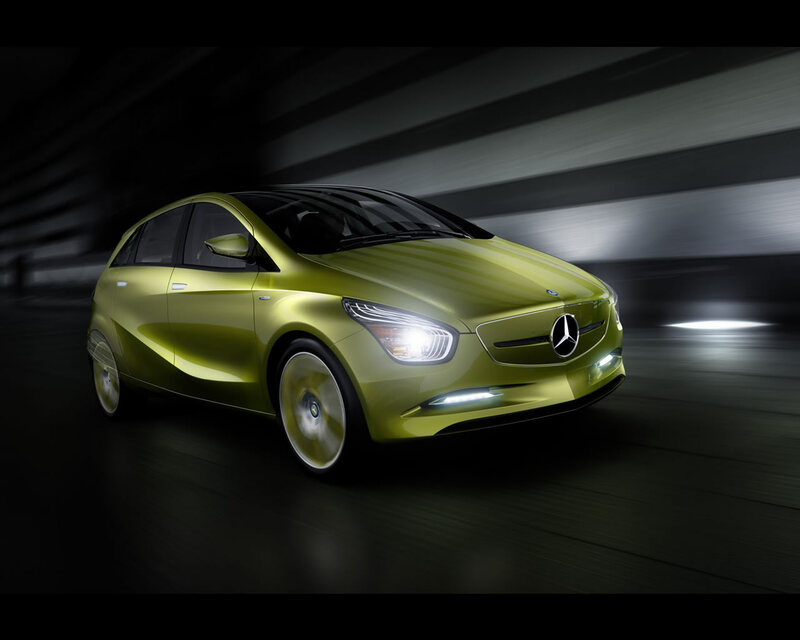 Small scale production of Mercedes Benz cars with battery-electric drive alone will then commence in 2010. This means that we are extremely well equipped for the future." All three BlueZERO models feature front-wheel which is typical for this class of car. 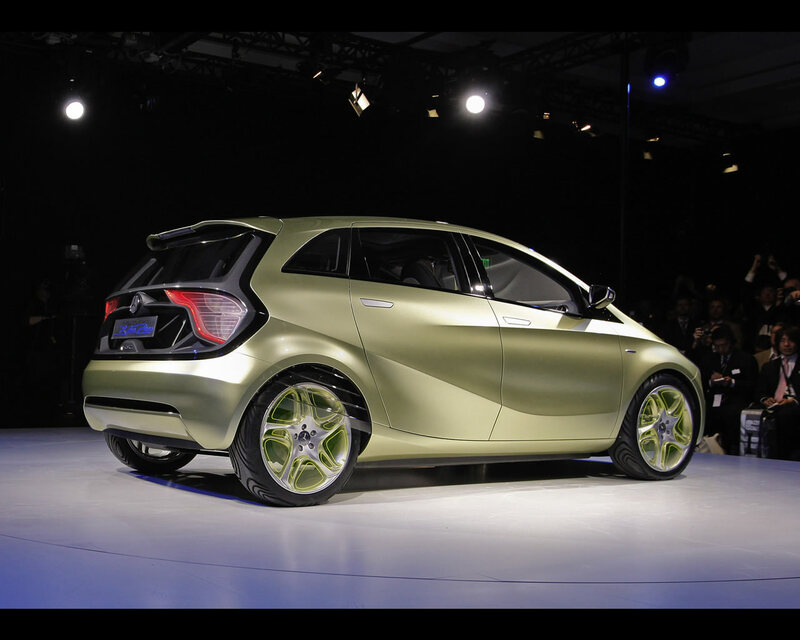 The Mercedes engineers have put together a modular system comprising several flexibly combinable drive components. These include state-of-the-art liquid-cooled lithium-ion batteries with a storage capacity of up to 35 kWh and the compact electric motor with a maximum output of 100 kW (continuous output 70 kW) which develops a peak torque of 320 Nm. All three variants accelerate from 0 to 100 kph in less than 11 seconds. 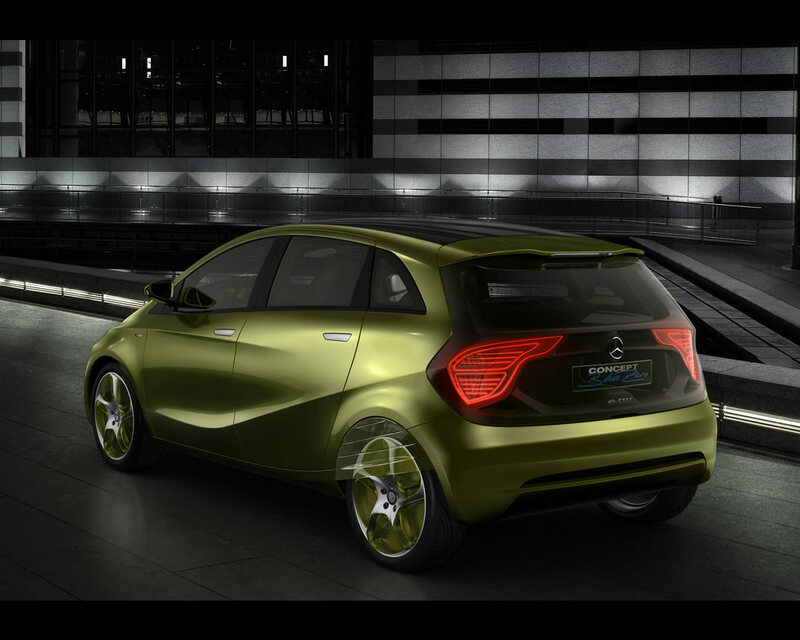 The top speed is electronically limited to 150 kph in the interest of optimal range and energy efficiency. 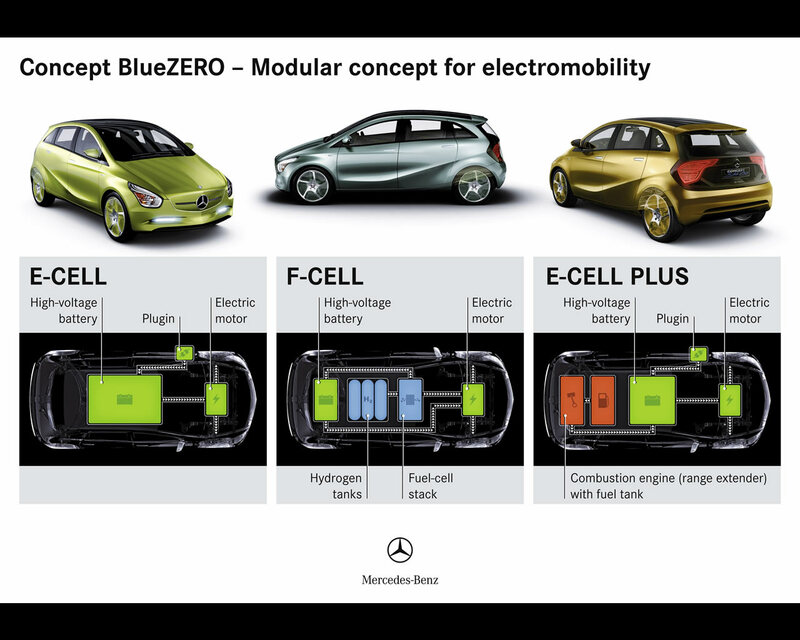 The Mercedes Benz BlueZERO concepts offer electric drive systems with a range of 100, 200 and well over 400 kilometres. With a charging capacity of 15 kW, the powerful lithium-ion batteries in the BlueZERO E-CELL and the BlueZERO E-CELL PLUS can store enough energy for a range of 50 kilometres within 30 minutes. In terms of purely electrical drive, one or two hours of charging time is needed for a range of 100 and 200 kilometres respectively. The charging times are doubled if the charging capacity is 7 kW, as would be the case in a conventional household. Both these BlueZERO vehicles incorporate an electronic control unit that supports intelligent charging stations and billing systems. At the rear, the BlueZERO E-CELL PLUS has the same 1.0 litre turbocharged petrol engine as the Smart Fortwo as an additional range extender. This compact three cylinder powerplant has an output of 50 kW at a constant 3.500 rpm. If required, it can recharge the 17,5 kWh lithium-ion battery by means of a similarly rated alternator. A range of up to 600 kilometres is possible on a single fuel tank. The purely electrical range is up to 100 kilometres. 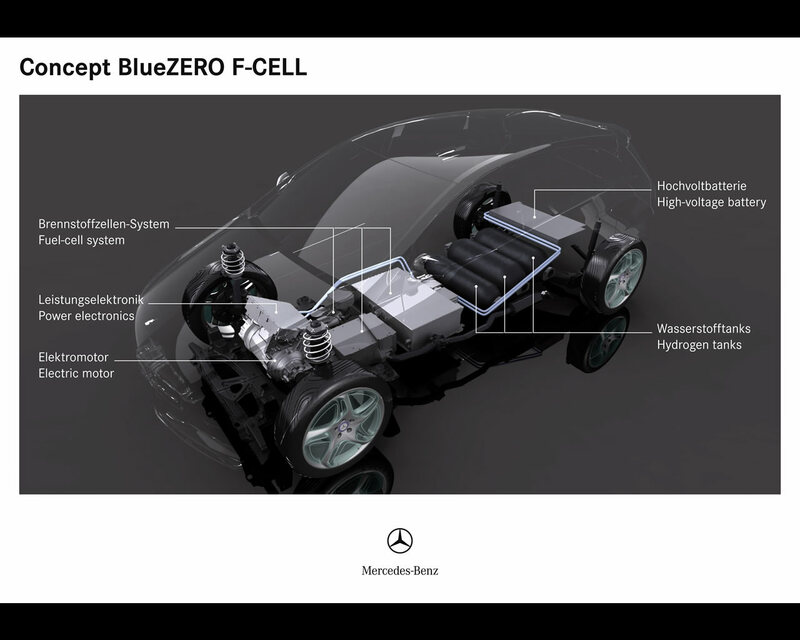 The BlueZERO F-CELL with fuel cell powered drive achieves a range of well over 400 kilometres with zero emission. On December 15th 2008, Daimler AG and Evonik Industries AG have signed an alliance for developing the energy storage of the future. Based on lithium-ion technology from Evonik and with Daimler expertise, both groups will drive forward the research , development and production of battery cells and battery systems in Germany. 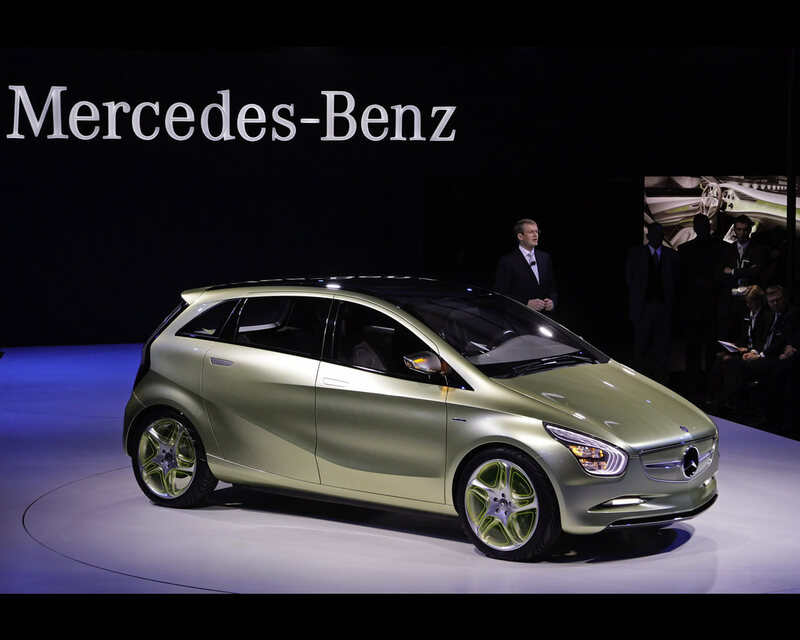 In the near future, Li-Tec cells will appear in electric vehicles of Mercedes Benz cars. This will represent an important milestone in the series production of electric vehicles. In the last 30 years, Daimler engineers have registered over 600 patents associated with battery powered vehicles, over 230 of which were in the field of lithium-ion technology. On December 15th 2008 Daimler AG takes over 49,9 percent of Li-Tec Vermögensverwaltung Gmbh. Evonik Industries AG already holds 50,1 percent. Furthermore, the companies will also establish a joint venture with a clear focus on the development and production of batteries and battery systems for automotive applications. 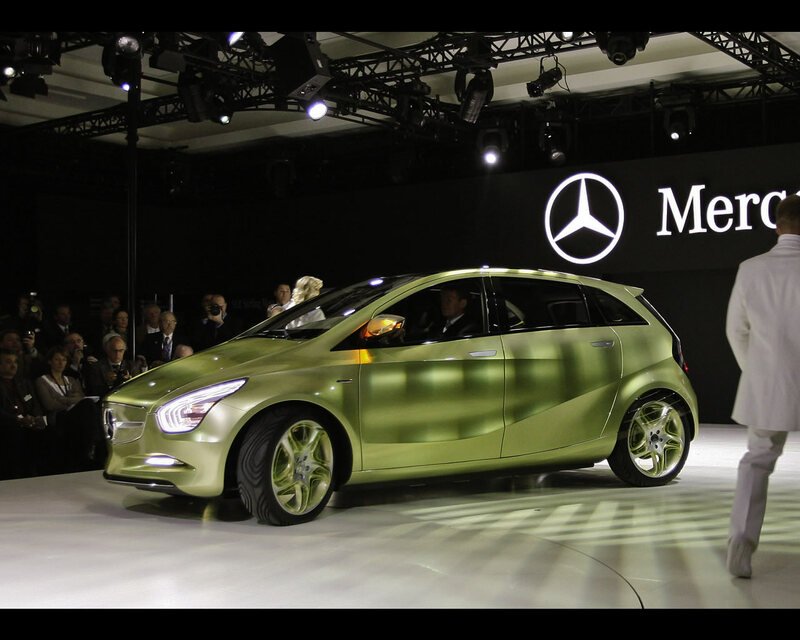 Daimler will hold 90 percent of this joint venture and Evonik 10 percent. The lithium-ion batteries produced by the joint venture will be used in both passenger car and commercial vehicles sector. 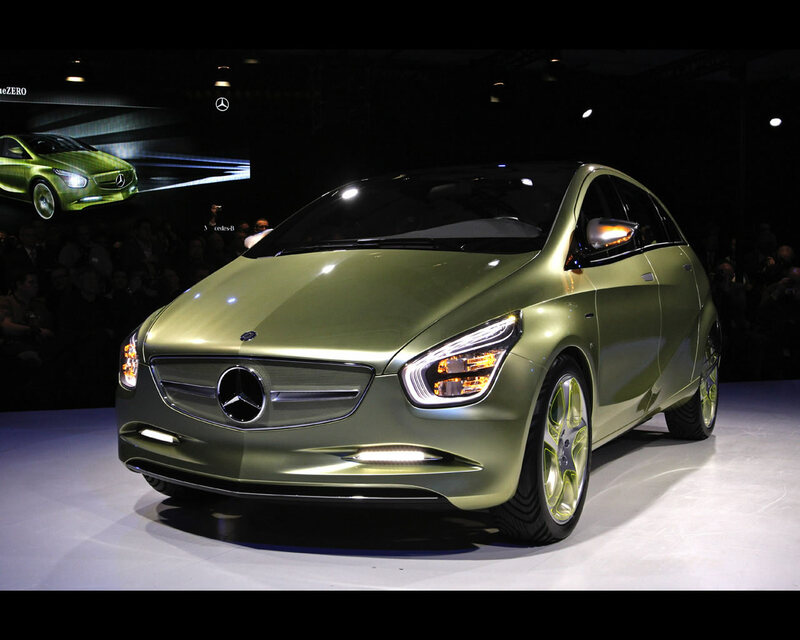 The capacity available at Li-Tec and the joint venture will initially concentrate on the needs of Daimler AG. Beyond that, the sale of cells and battery systems to third parties is planned.